SSI Energy’s MERTs provide critical emergency care both offshore and to onshore remote sites from the point of injury until the arrival of the national emergency care service. SSI Energy’s medics are all experienced operators on wind farms and are able to carry out a multitude of technical tasks whilst on site, as well as medical and scenario training, improving the overall standards of HSEQ. Round 3 wind farms are being constructed further offshore than ever before as well as Operation and Maintenance (O&M) being carried out now on the existing Round 2 wind farms. 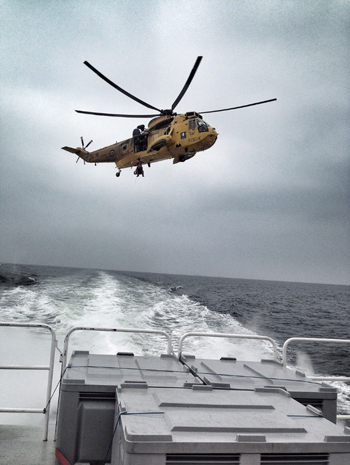 SSI Energy’s MERTs are designed to enhance the current medical and rescue provision provided by the Search and Rescue (SAR), RNLI and NHS Ambulance to minimise the risk to offshore personnel. SSI Energy’s management with a long and established track record of managing emergency response teams to rescue, stabilise, and then transport trauma and medical casualties have designed the MERT for the offshore renewable industry to bring the Point of Care (PoC) much further forward (replicating the military system seen as best practice). This will see treatment being provided well within the ‘Golden Hour‘. SSI Energy knows that experience is key and that is why all of SSI Energy’s medics have at least 2 years’ experience of frontline emergency care, from the military, fire or ambulance service. All our medics carry a paramedic kit, satellite phone, defib and rescue stretcher. SSI Energy’s MERTs operate under a strict Clinical Governance scheme. All our medics are regularly audited, inspected and trained, overseen by the country’s leading emergency care consultants. SSI Energy’s Clinical Governance provider is the most rigorous in the business – responsible for the clinical governance of national fire and ambulance services. This ensures our service is delivered to the highest standards and in line with best practice.